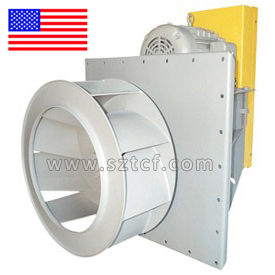 The versatility of the BFPL Plug Fan allows them to be used for air circulation in a variety of commercial and industrial applications including air curtains, air heaters, ceiling, wall and floor panel plenums, degreasers, dryers, dust collectors, evaporators, freezers, kilns, ovens, packaged air handlers, parts washers, penthouses, smoke houses, space heaters, spray booths, and other high temperature applications. The BFPL plug fan features a SWSI backward curved, non-overloading, single thickness airfoil type wheel. The unique wheel offers increased efficiency over competitor’s airfoil blade designs, yet can handle airstreams not conducive to traditional hollow airfoil shapes.